What if we could hit the reset button on the way we create money, work, commerce, and community? This is not an idle question, for technology now enables us to hit that reset button and organize the creation of money, work, commerce, and community in new ways. If we could start from scratch, what would a new system look like? To answer that, we must understand why the current system is failing. The current system is based on five principles that are assumed to be true: Money created by banks trickles down to create work for all, technology creates more jobs than automation destroys, centralization is the solution to large-scale economic problems, expanding debt and consumption (i.e. growth) is the path to prosperity, and maximizing private gain organizes the economy to the benefit of all. All five have proven to be untrue. No wonder inequality is rising and opportunity is declining. Clearly, we need a new system that offers what the current system cannot: meaningful work for all. 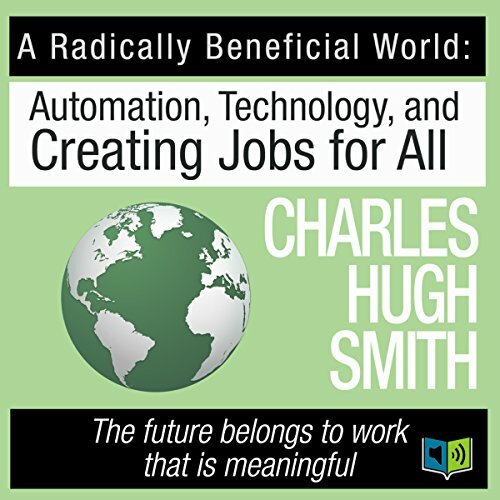 This book describes a global system that integrates money, work, commerce, and community in new ways, using social/technical innovations that are already in daily use. This book is the practical blueprint of a new system that offers opportunities for meaningful work and ownership of the sources of prosperity not just to a few, but to everyone. In this system, every individual has the power to change the system for the betterment of themselves and every other participant. Being at the top of the heap is no longer a prerequisite. Everyone who is powerless in the current arrangement is empowered in this new system. Empowered to not just better themselves and their family, but better their community and the larger community of planet Earth. A radically beneficial world beckons - what are we waiting for? Fix the speed because the content is worth it! I love the content but someone stuffed up the audio recording! I am forced to listen at 75% speed on my iphone. The producer should re-export the recording at 85-90% speed and it might be OK. So far I am really enjoying the story, but disappointed with the speed at 1.25! subject matter was interesting. Very difficult to comprehend the subject matter because the narrator speaks too fast. annoying. Almost didn't listen to the whole book. Subject matter was very interesting. Can't say I agree with all of it. Would you be willing to try another one of Leslie James’s performances? No. Tried listening at 3/4 speed but that was worse because it sounded like the narrator was stoned on pot. Audible needs to computer alter the narration by introducing small gaps/spaces between words to space out and slow down the read. I work as a Manufacturing Engineer. and I can tell you the US will be in serious trouble within the next 10 years. There simply are not enough young people "in-the-pipeline" to replace babyboomer aged Toolmakers, Machinists, Engineers, etc. Our manufacturing will grind to a slow crawl. Robots can't do it all. The Narration. The reading of this book reminded me of a nervous kid in middle school reading as fast as he could just to get it over with. No pauses or inflection, just one long sentence running for 6 hours. Was A Radically Beneficial World worth the listening time? I love CHS. Read his blog almost daily and have read one of his other books. A great thinker with valuable knowledge to share. Unfortunately, if this audible book is the listeners first introduction to CHS then the listener will probably never listen or read any of his other great material. I can't believe that this audiobook passed any type of quality control check before being released. A very good conception of what society could be if the latest technologies are integrated to the benefit of the public.